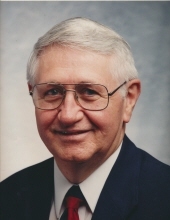 MADISON-David Michael Dwyer, treasured father, grandfather, and husband, age 81, of Madison, passed away on Tuesday, April 9, 2019. He was born on Aug. 3, 1937, in Sparta, Wis., the son of Phillip and Mae (Shie) Dwyer. He married Mary Vandehei on Oct. 24, 1964, in Green Bay, and together they raised three sons, Tom, Mark, and John. Dave obtained his Bachelor of Science from UW Platteville in 1959 and saw brief active duty in the U.S. Army in 1961. Dave worked as an underwriter and manager for American Family Insurance for 35 years, retiring in 1999. He and his wife, Mary were devoted members of St. Dennis Catholic Church, where he served as president of the St Dennis Parish Council. Dave was chairman of the Minor Home Repair Commission at the church and served on various personnel and other commissions as well. He was a member of the Knights of Columbus and volunteered with St Vincent de Paul Society. Dave truly loved to help people and was known around his neighborhood and to many senior citizens as Mr. Fix It. He loved being around people and was involved with several card groups. Above all, Dave cherished his family and especially loved any time spent with his grandchildren. He will be remembered for his bright, infectious smile, his extraordinary sense of humor, positive and upbeat attitude, and his love of life. He will be dearly missed by all who had the pleasure of knowing him. Dave is survived by his three sons, Thomas (Christy), Mark and John (Holly); five grandchildren, Jacob, Danica, Boden, Jocelyn and Ryken; his brother, Michael (Bea); sisters-in-law, Lorraine and Donna; as well as many other dear friends and relatives. He was preceded in death by the love of his life, Mary; his parents; three brothers, Tom, Phil and Pete; and sister-in-law, Jan. A Mass of Christian Burial will be held at ST. DENNIS CATHOLIC CHURCH, 505 Dempsey Rd, Madison, at 10:30 a.m. on Saturday, April 13, 2019, with Fr. Randy Timmerman presiding. Dave will be laid to rest next to his beloved wife Mary at Highland Memory Gardens. Visitation will be held at GUNDERSON EAST FUNERAL AND CREMATION CARE, 5203 Monona Dr., Madison, from 4 p.m. until 7 p.m. on Friday, April 12, 2019, and again at the church from 9:30 a.m. until the time of the Mass on Saturday. In lieu of flowers, memorials may be directed to the family for a scholarship fund to be set up in Dave’s memory. Online condolences may be made at www.gundersonfh.com. "Email Address" would like to share the life celebration of David Michael Dwyer. Click on the "link" to go to share a favorite memory or leave a condolence message for the family.